Safety in plants is a big deal. We all want to make sure our workforce remains safe and can get the job done. Exposure to chemicals is never a good thing, and XR QuikLiner has the extensive product knowledge and innovative solutions to eliminate this potential hazard in your plant. We put quality and partnership at the forefront—which is shown in every service we deliver and every product we manufacture—and ultimately improve your team’s output. Not only is XR QuikLiner more cost-effective than chemical additives admixtures used in concrete, but it contains no volatile organic compounds (VOCs) or nasty odors. Admixtures are chemicals added to fresh or hardened concrete to give it special properties, such as to enhance the durability or strength characteristics of a concrete mixture. Water-reducing concrete admixtures are some of the most widely used admixtures, particularly crystalline admixtures. Crystalline admixtures act as a waterproofing solution by turning concrete into a water barrier. When combined with water, the chemicals react to form crystals that grow and fill the micro-cracks, preventing water from absorbing. 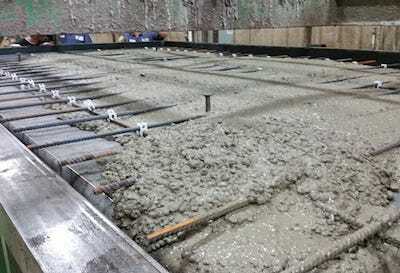 XR QuikLiner offers fast and affordable chemical resistance for precast concrete products. Ready to discuss how XR QuikLiner can help you? Contact us today or check out our additional product information sheets. Consistent—XR QuikLiner is a prefabricated form liner that removes the guesswork of consistent protection application.